One of my favourite things about living in Sydney is the restaurants. I live just off a street renown for cheap, cheerful and varied eats, and I love that at 7pm on any given night, if I say, ‘I want Thai/Mexican/Portuguese/French/Japanese/A Kebab,’ I can walk to a restaurant in five minutes. I’m very spoiled, but it makes it easy to get complacent and not venture outside of my trendy-bohemian suburb. However, last Tuesday night, I went to Bay Tinh Restaurant in Crow’s Nest, and was so glad I did. I grew up in a small and isolated town, so it’s only been over the past five or so years that I’ve been exposed to many different types of cuisines. Vietnamese is fast becoming a favourite, and my experience at Bay Tinh definitely reinforced this. Bay Tinh first opened in Marrickville in 1988, by M. Tinh Tran. Tran is an extraordinary man – he worked as a chef to the Prime Minister of the Republic of South Viet Nam before arriving in Australia as a refugee. Tran had no money when he arrived, and he worked hard in restaurants in order to fulfill his dream of opening his own. In 2007, once he reached retirement, Tran sold the restaurant to Harry Hoang. Hoang opened up a second Bay Tinh in Crow’s Nest late last year. My friend Anna-Lou accompanied me to the Crow’s Nest Bay Tinh, and we knew we were in trouble from the moment we entered the door: fragrant smells hit us instantly. Despite seeming small from the outside, inside the restaurant is well-designed so it seems spacious. We didn’t feel as if we were too close to any other table and couldn’t hear anyone else’s conversations, which always makes for a more pleasant dinner experience. The restaurant had gorgeous red lanterns hanging from the ceiling, which gave a gorgeous and comforting glow. Due to the sheer enormity of dishes, the menu itself can seem a little overwhelming. If you have a group of 4 or more, I’d suggest you go with one of the banquet menus (they range from $30+ per person), as you’ll get to try a range of dishes that are perfectly picked out. The menu has an extensive list of tapas-like entrees (nicknamed as ‘vapas’), and also mains. The menu explains that the food is meant to be shared, and one dish is supposed to come out at a time, as it ensures it’s eaten as fresh and as warm as possible. I love this idea – you get to really experience and appreciate each dish. Just a slight word of warning however: because they are brought out depending on the time it takes to create them, the dishes might not be bought out in the exact order you order them. Anna-Lou and I shared the Tasting Plate 3 ($30) and also the Prawn Wrapped Sugar Cane ($26.50) and Grilled Pork Skewer ($26.50). Since we were starving, we didn’t study the menu as carefully as we should have, and wound up essentially having the same dish twice (which was fine, because it was delightful, but we got some food envy from a few of the other dishes we saw and smelt being sent out to other tables). Both the Prawns and Pork are served in a style similar to San Choy Bau – crisp lettuce leaves host a neat stack of a rice noodle cake, pickles, and mint in the middle, with either the prawn or the pork resting on top. You then dollop a spoonful of the special sauce, and then fold up the lettuce and enjoy little parcels of yum. While the dish sounds simple, it is made with such care and precision. You can really taste the individual and unique flavours that the meats are prepared in – there are just enough to compliment and bring out existing tastes, but not enough that they are drowned to the point that you taste the seasoning more than the meat. There are a few different options for the tasting platter, each with three things (per person) to try. My favourite was the Banh Xeo (crispy pancake) which was full of beef, prawns, pork, and bean sprouts – the pancake walks the fragile line of crisp and delicate with precision, and while the filling has several unique flavours, they compliment each other instead of fighting for your attention. As well as having an impressive wine list, Bay Tinh also has a cocktail list (which included a mocktail that made driver Anna-Lou fairly happy). The cocktails are made with fresh ingredients and are a little more exotic than ones found in traditional bars, but manage to still be classy (there’s nothing that sounds like it should be served in a coconut with a million little umbrellas). We were disappointed when dessert ordering came around because we had been fantasying about the Lychee Moose, but alas, it had sold out. We instead shared the Rum Coffee Parfait ($7.80) and The Deep Fried Ice-Cream ($4). Deep Fried Ice-Cream rarely disappoints, and ours was no exception. Crunch on the outside and gooey and melty on the inside – and absolutely smothered in chocolate syrup – the perfect dish for the six year old in any of us. The Rum Parfait, however, nearly caused Anna-Lou and I to end our friendship over who got to have the last bite. Rich and velvety soft, the parfait is like a cross between an ice-cream and a noose. The flavours are strong, with a sweet kick, and are completely moorish. The caramel walnuts provide a crunch, and I think I could eat an entire bowl of them and be a very, very happy girl. I was also lucky enough, halfway through the meal, to meet Harry. Throughout the night, Harry takes the chance to go over and have a chat to every table in the restaurant – to make sure they are enjoying themselves, to check if they have any questions, to ask them how they found out about the place. Harry was incredibly genuine and warm, and it’s clear he really cares about his customers, and is passionate and committed to making their experience the best it can be. Overall, the food was fresh, delicate, and just beaming with health. I will definitely be back to Bay Tinh – only this time with a large group of friends, so I can sample much more of what is on offer. Just a quick word of warning – parking near the restaurant can be a little difficult (there is a Woolworths nearby but it fills up fast, and the area has quite a few restricted turns), so if you make a reservation, it’s best to give yourself a little extra time to find a suitable spot. Bay Tinh Crows Nest: (02) 9438 5118. 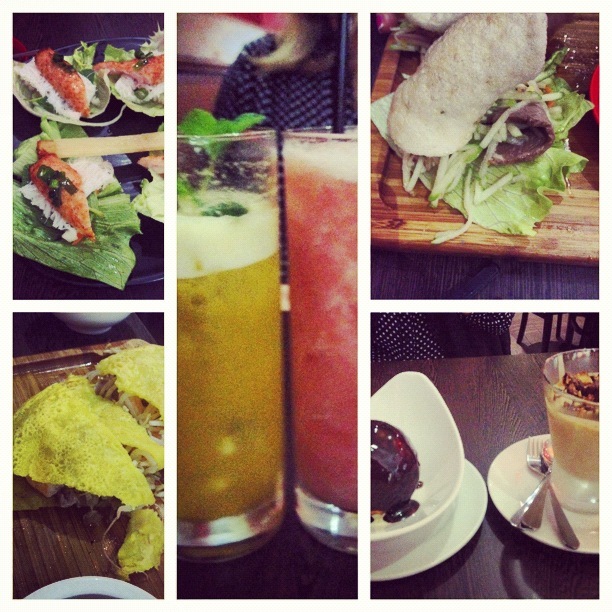 This entry was posted in Culture and tagged food, restaurant review, sydney. Bookmark the permalink.